Master’s Token, 50th Year, from Sandia Mountain Lodge #72, Albuquerque, NM, where I was initiated, passed and raised. This token was presented to me by WM Lance Hale when I attended my first stated meeting (2.Dec.2008) at the Lodge after being initiated as an EA. 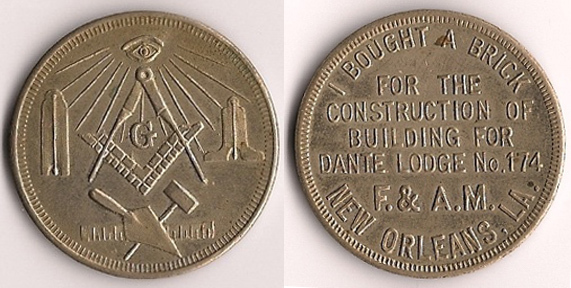 Masonic token from Dante Lodge #174, New Orleans. Recto shows working tools and the Eye. I bought this in an antique store/mall in New Orleans in the Garden District, Jan 2009. At the time of cataloging this, the GL Louisiana page says that Dante #174 meets at the building owned by Germania Lodge #46. Uncertain if the building mentioned by this token is that now run by Germaina 46, or if it was another which is no longer in use. Ancient Order of Camel Herders medallion. AOCH is a side degree for the AAONMS, the Shriners. 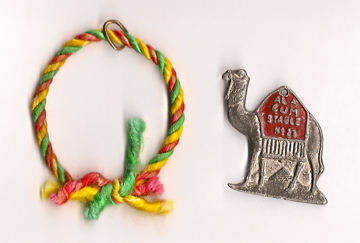 A camel-shaped medallion or medal, silver pot metal with red paint on the cloth draping the camel. Came with a colorful string, which I removed so I could place it flat on the scanner. I purchased this from Connie Fulwyler at Old Town Antiques in January, 2009. 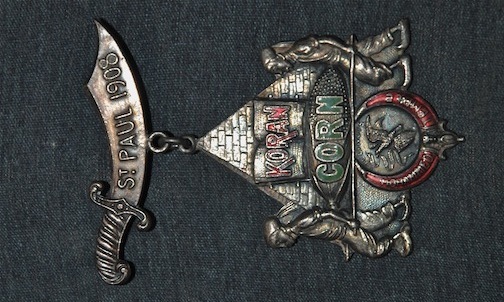 Medal from Mohammed Shrine Temple, Peoria Illinois, issued for the 34th Imperial Session which was hosted in St. Paul, MN, by Osman Temple in 1908. Medal sports a scimitar, reading “St. Paul 1908” from which dangles the main body, consisting of a pyramid, in front of which walks two characters in fezzes, baggy clothes and pointy shoes, carrying a pallet holding a giant cob of corn, on which in green enamel is written “CORN.” Atop the corn is an open book, on which in red enamel is written “KORAN”. Below the figures is a slender red enamel crescent opening upward with a flowering element and sphinx head at the bottom. Within the red enamel of the crescent is written “MOHAMMED TEMPLE” and within the circle created by the crescent is an abbreviated version of the Illinois state seal, a bald eagle carrying a striped shield in its talon and a ribbon in its mouth. This medal falls within my “Masons Behaving Badly” sub-collection for being a dialectal play on words stemming from the assumed poor pronunciation of the word Qur’an by American Midwesterners in the early 20th Century, and for the slightly black-face-y depiction of Arabs (although, these could be arguably Shriners, instead!). Verso a circular raised stamp reads Whitehead and Hoag. TAFC.2011.31 ~ Springfield Commandery No.6 Medal, Springfield, Mass. A medal from Springfield Commandery No. 6, Springfield, MA. Probably issued for a Grand Commandery Conclave. Upper part is shaped as a sperm whale, with “K SPRINGFIELD COMDY. No.6 T” in relief down the length of the beast. 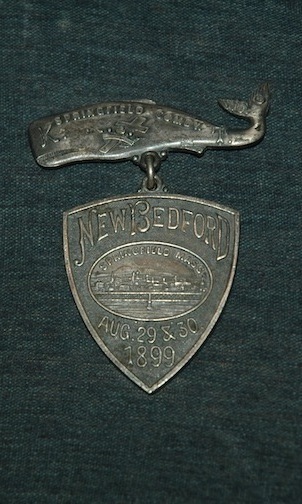 From the whale dangles a shield, which reads “NEW BEDFORD” above and “AUGUST 29&30” below. In the center is an oval with an image of the roof line of Springfield, MA. 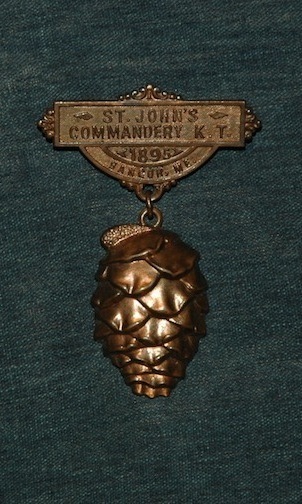 A medal from St. John’s Commandery in Angor, Maine, dated 1895. The Commandery is not given a number here, but a web search shows it numbered No.3 (at least, in 1937). The medal is in copper or otherwise coppery-toned metal, and consists of an upper portion shaped as a plaque with a semi-circular panel below, from which hangs a pressed pine cone form. This is one of my favorite items in my collection, for its simplicity, its suggestion, and uniqueness. Maker’s name is stamped into the metal behind the pin, upper verso. Ancient Egyptian Order of Sciots medal from Bert Kirkpatrick Pyramid #56 in San Diego, CA. 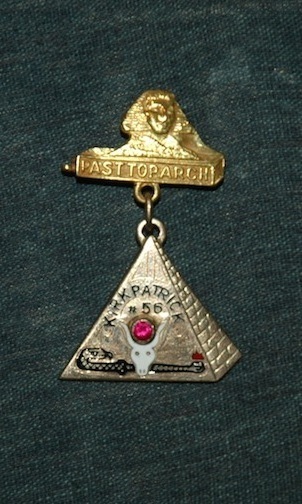 Medal consists of two pieces, upper being in cheap yellow metal showing the Great Sphinx head emerging out of the sand, with PAST TOPARCH in relief along bottom, from which dangles a pyramid in more naturally gold toned metal, adorned with the emblem of the order, with the bull head in white and the sun disk a ruby-red stone set in a bezel, with the flame in red enamel. Further details are rather finely engraved into the metal. 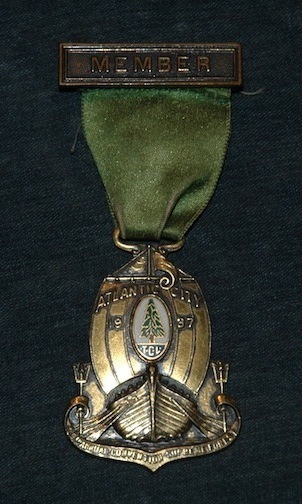 General member medal from the 35th Annual Convention of the Supreme Forest of the Tall Cedars of Lebanon, held 1937 in Atlantic City. Medal has an upper plaque with “MEMBER” in relief, from which hangs a green satin ribbon, in turn supporting the medallion in the shape of a ship, charging through the waves toward the viewer, sails full and oars in the water. In the center of the sail is the emblem of the TCL, done in multicolored enamel with probably gold fill, around which is relief reads “ATLANTIC CITY 1937”. At the bottom, a scroll element stretches from one trident across to another, on either side of the hull, and reads “35th Annual Convention Supreme Forest”. Verso has Whitehead & Hoag makers stamp. The medal is particularly beautiful and well made, the relief is deep and the enamel is colorful. A favorite of mine in the collection. 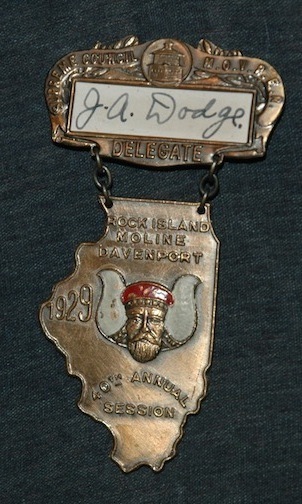 Delegate medal for the 40th Annual Supreme Council Session of the Grotto (Mystic Order of Veiled Prophets in the Enchanted Realm), held in Illinois (medal reads “Rock Island, Moline, Davenport” in top section of main medal). Upper panel is roughly rectangular with scrollwork across top, with an image of a building in center. Lettering in scrollwork reads “SUPREME COUNCIL M.O.V.P.E.R” above and “DELEGATE” below. Delegate’s name is still extant on slip of paper held inside upper panel, “J.A. Dodge.” No indication as to which Grotto this gentleman was from. Lower portion of medal is die-cut in the shape of Illinois, slightly broadened in porportion, with the Mokanna head in center, apparently painted with white and red, rather than enameled, as the pigments are scratching off. Maker’s stamp verso of the Illinois-shaped panel. Unfortunately, I very rarely sell pieces from my collection, but thanks for your interest. These do come up on eBay on occasion, and antique stores in California (especially) are not UNlikely to have some in their cases, as well.